How to change the urlbar richtext results colors? I'd like to change the urlbar colors especially the ugly blue highlight which doesn't fit well with the colors I have in my theme. The url's are also blue, which I don't like. What I would really like to know now is how can I use the the color that's given by the system (windows 8). AKA the color of the titlebar, which changes when my desktop wallpaper changes. I'm hoping there's a special -moz-Something color for this (like -moz-Dialog). I could work around this when I was toying with the sidebar and tabs by by going up the hierarchy and setting the parents' colors' to transparent until I reached this color. But apparently whatever is on top here is colored black or something dark colored. Well, I ran out of ideas. Okay, now it works. But I think there's a misunderstanding, I have problems with changing change the the highlight/background colors of the results. This works also. (I see this way it also affects other selected text, which might be good) Though My main problem. Okay, sorry I wasn't clear enough in my first post. The colors of the urlbar [url]results[/url] are my main problem. I want to base the colors on the system color or whatever the name of the color of the titlebar is in windows. Which the default theme uses on some level. I could also set other UI elements (tabs, sidbar) to depend on this color by making them and their parents transparent. But this approach didn't work with the urlbar results, they just got black. So the problem I can't solve is how get this "titlebar color" or whatever to the urlbar results. Yep, that's how it works. I started by coding it to be url/searchbar specific and then realised that if an OS selected background/text colour is crap (most are) then really they should all be changed, so that's what I did. However, I can see now that wasn't your main problem, next time I'm in Firefox I'll have a look at how I've done all that, it's not hard to do, as I recall. But, I don't really *do* native OS effects in my stuff, I override everything. So a more 'native' look themer will probably be able to advise you better on your particular requirements. avada wrote: I want to base the colors on the system color or whatever the name of the color of the titlebar is in windows. There you are out of luck. There is a very old bug out on getting "Aero" colors which no Mozilla folks (or anyone else apparently judging by online discussions) could figure out. I figured out how to do the maths to extract the colors a few years ago, but now no-one can be bothered to build a patch for it (because below). avada wrote: Which the default theme uses on some level. Nope. What the default theme does is apply transparencies on top of the titlebar itself. Because they think that's especially clever, they won't bother to to actually extract the real color. patrickjdempsey wrote: There you are out of luck. There is a very old bug out on getting "Aero" colors which no Mozilla folks (or anyone else apparently judging by online discussions) could figure out. I figured out how to do the maths to extract the colors a few years ago, but now no-one can be bothered to build a patch for it (because below). So I'm guessing you can channel the color to the urlbar results is because they're not "on" the window but overlaid over other ui elements. 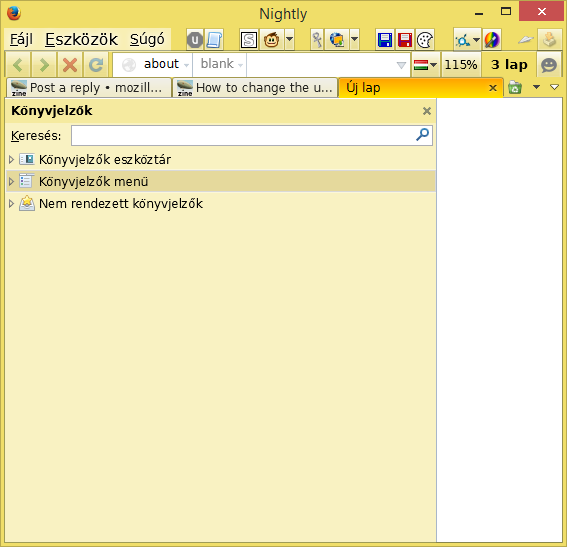 I use for the titlebar the native appearance on Windows. Have a look on one of my themes (I'm at work now, can't figure out the code).